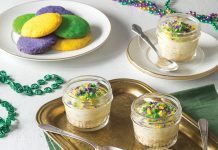 One of the most recognizable Mardi Gras sweets, the traditional king cake is seen in most New Orleanian homes throughout Carnival Season. 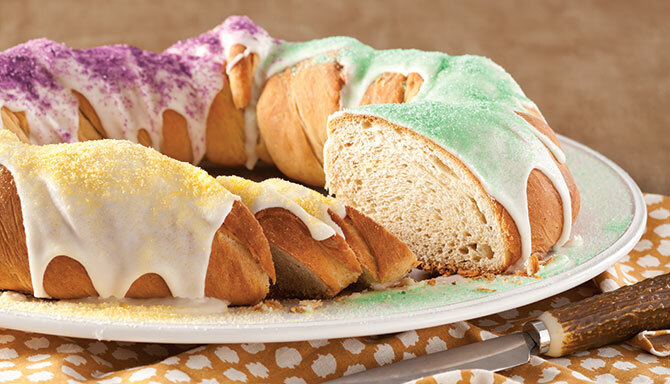 This traditional king cake is topped with glaze and colored sugars. 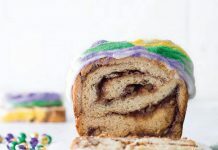 Make sure to bake one before heading out to the Krewe of Rex parade on Mardi Gras Day. In a small bowl, combine milk and yeast, and let stand until foamy, about 10 minutes. In the bowl of a stand mixer fitted with the dough hook attachment, combine milk mixture, butter, eggs, egg yolk, and cane syrup; mix at low speed until combined. Add flour, salt, and cinnamon; mix at medium speed until a smooth and elastic dough forms, about 10 minutes. Spray a large bowl with nonstick cooking spray. Form dough into a ball, and place in prepared bowl, turning to coat top. Cover with plastic wrap, and let rise in a warm place (85°) until doubled, about 1 hour. On a lightly floured surface, punch dough down and form into a 30-inch log. Spray a baking sheet with nonstick cooking spray. Place log onto prepared pan, twist 4 times, and bring ends together to form an oval. Loosely cover with plastic wrap, and let dough rise until doubled, about 1 hour. Bake dough 10 minutes, then reduce oven temperature to 350°, and bake until deep brown, about 25 to 30 minutes more. Cool on a wire rack. 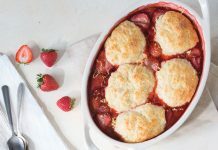 In a medium bowl, whisk together confectioners’ sugar, half-and-half, and extracts. Set aside. Hide bean or baby on the underside of the cake. Drizzle with sugar glaze, and sprinkle with Colored Sugars.